This book provides a concise and practical overview of hospital based emergency, urgent and primary care service in Ophthalmology. Specialist consultants who wish to broaden their knowledge of the various ophthalmic conditions seen in clinical emergencies will find this book to be a useful go-to guide. Advice is given on establishing an ophthalmic emergency and primary care service and a series of chapters cover the management of emergency eye conditions. 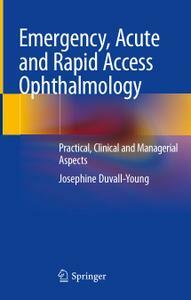 Emergency, Acute and Rapid Access Ophthalmology is a must read for all ophthalmic professionals in the UK and worldwide who are dealing with the growing demand for emergency eye care services and the increasing sub-specialisation within Ophthalmology.